Early this morning I decided to take a walk. A dusting of snow covered lawns and portions of sidewalk. The air was crisp and clear. The sun was barely up. One of the best times to wander; when most of the world is still asleep. A few blocks from the house I met up with a stray yellow lab. He greeted me with a gentle sniff and I gave his head a scratch. We walked together until a scent near a tree intrigued him and we parted ways. 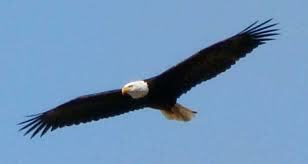 About a mile from home I spotted a bald eagle soaring overhead. Years ago this would have been a rare occurrence but no longer. The eagles have made a come back and I often see them on walks or while I’m in the yard. This time of year eagles can also be seen on the ice near the open water on the river. Once I counted near 20 of them. 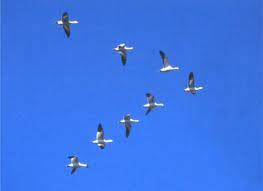 A few nights ago on a walk I heard the call of geese as they were on their return trek north. I didn’t see them, as the skies were dark with no moonlight to light the sky, but I could imagine the v-formation. My thought at the time was that it is only February and they shouldn’t be moving north yet. But since we haven’t had much of a winter this year why not migrate. The geese will be fine.